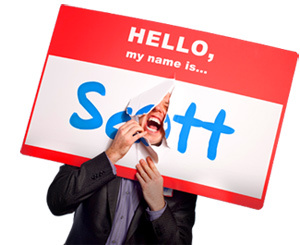 How Thought Leaders Can Create an Unquestionable Knowledge Base - HELLO, my name is Scott! As a Thought Leader, you need to be a master of your subject. That means always challenging yourself. That means constantly updating, refining and deepening your expertise. IN SHORT: You need to be able to talk forever. Denver. February 12, 2007. National Speakers Association Winter Workshop. A man named Mike Harrison, a veteran from the broadcasting industry, delivered the lunch keynote. Irreverent, brilliant, grizzled, Mike shared powerful wisdom from fifty years of award-winning broadcast excellence. Namely, his days working at a radio station with Ronald Reagan. As Mr. Harrison explained, during one game between the Cubs and Cardinals that was tied 0-0 in the 9th inning, the telegraph went dead. Without as much as blinking, Reagan smoothly improvised a fictional play-by-play until the wire was restored. He wasn’t even there and millions of listeners had no idea. Because Ronald Reagan could talk forever. What about you? Could YOU talk forever? Here’s a list of four strategies for creating an unquestionable knowledge base. Now, most of the time, you’ll know immediately whether or not you’ve written about something yet. See, writing comes from a deep place: Your Being, Your Core. Your Truth. So, whenever you’ve written something – that is, clarified, explored and expanded your thoughts on paper – those ideas become permanently etched into your consciousness. They’ve entered the matrix, so to speak, and they’re there forever. IN SHORT: When you write it down, you make it sound. Ever. That’s the converse. And it’s the number one mistake made by creative professionals, writers and thought leaders worldwide: They don’t write everything down. If there’s one piece of feedback I’ve given to every client I’ve ever coached, this is it. Now, that doesn’t mean you need freak out if you come across a thought or idea that you haven’t written about yet. Just pause for a moment, capture the key point or theme in your journal or on a napkin, then return to what you’re doing. You’ll write about it later. For now, all that matters is that you get it down. What did you write today? Is everything you know written down somewhere? 2. Create a system for staying constantly relevant. The word “expertise” contains the same Latin root as the word “experience.” This means that, as a Thought Leader, you actually have to DO stuff, every day. You actually have to leave the house, venture out into the world and broaden your thinking. Expand your references. Practice. 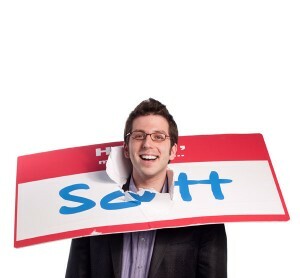 o I wear a nametag 24-7. This keeps me constantly relevant for when I conduct workshops and seminars about approachability. What do YOU do everyday? o I write for 4-7 hours everyday. This keeps me constantly relevant for when I coach other writers on content generation and content management systems. What did YOU write today? o I grow my business a little every day. I make career development a daily activity. This keeps me constantly relevant for when I publish articles and blog posts about how to grow your business. What specific action did YOU take today to grow your business? o I read five books a week. This keeps me constantly relevant as I elevate my position as a Thought Leader. What did YOU read today? o I meet new people; make friends, post blogs, tweet and network everyday. This keeps me constantly relevant for when I produce video modules and customized learning systems on internetworking, entrepreneurship and marketing strategy. Did YOU leave the house today? REMEMBER: If your knowledge base is dependent on some outdated accomplishment that’s no longer impressive OR applicable – like when you won the bronze medal for the Triple Jump in the 1988 Olympics – people aren’t going to listen to you. Because you’re not relevant. What you did twenty years ago doesn’t help your clients make money TODAY. What have you done lately? What did you do YESTERDAY that deepened your expertise? 3. Read everything else written on your topic. You need to know – or at least, know OF – related ideas of other Thought Leaders in your industry. That doesn’t mean you need to agree with them. That doesn’t mean you need to memorize their books line by line. But you DO need to be aware of them. HERE’S WHY: If someone asks you, “So, you consult on patient care, huh? Have you read the book Healing Words by Dr. Larry Dossey?” and you say NO, your stock just went down in their mind. You are no longer the perceived expert in their mind, which results in their questioning of your knowledge base. Yep. You heard me. Five hundred. I guarantee you that whatever your area of expertise is, between Amazon, used bookstores and local book fairs, you should be able to find (at least) five hundred titles on that topic. Easy. Here’s a fantastic exercise to get you started: Go to Borders. Put your stuff down at a table. Head over to your favorite section and pull out EVERY book that catches your eye or looks interesting. Try not to think. Just react. Next, bring the books back to your table. (You may have a few dozen.) Then, take out your notebook and start scanning. Not READING – scanning. Not plagiarizing – scanning. Big difference. Look at subheadings, chapter titles and boldface passages. 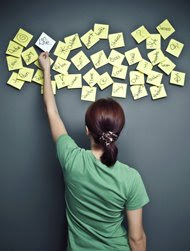 Skim around, extracting key ideas that relate your expertise. Fifty books in three hours? Not bad. NOTE: You’re not actually going to buy any of these books. This is a library day. It’s research. I call it “Fishing.” And it’s a perfect practice for flooding your brain with hundreds of ideas to deepen your expertise. That being said, you should probably buy some coffee and a muffin, just so you don’t feel like a complete cheapskate. What did you read today? How many books did you read last year? 4. Constantly add and explore new dimensions. Go deeper. Return to your work and figure out what’s evolved since you first wrote it. Recast working assumptions. Go back and discover what you’ve changed your mind about. Add new angles. Make it into a sequel. Hell, make it into a trilogy. Better yet, make it a series! Add textures and contours and layers to the matrix of your idea. Think broadly by seeing as many relationships as possible between (seemingly) unrelated concepts. This practice is called cognitive flexibility, in which you gain the ability to see at least three angles to any idea. For some Thought Leaders, this is a challenge – and it’s because of their gargantuan egos. They’re afraid to admit that they didn’t cover everything the first time. That they don’t know everything there is to know about (x). That someone else might have additional insight they overlooked. So, you expand your idea as much as you can until there’s nothing left and nowhere else to go – at least, for now. Then, when you go back to introduce these new strings of thought, your idea becomes richer, more whole and more resonant. HERE’S THE STRATEGY: Listen to your casual fans. Friends. Strangers. Relatives. Watch how they respond as you accidentally (or intentionally) “try out” a new thought, observation or chunk of material. Think of it as informal, unscientific market research. Write down what worked; take not of any additional dimensions your fans add. See what people laugh, marvel, shake their heads or flinch at. These little test runs are the perfect venue to validate the potential of your new ideas. NOTE: Just make sure you’re not overtly rehearsing or practicing or “doing shtick” all the time. Be conversational. No need to go into your entire new routine in the middle of dinner. Just hurl a few noodles and note what sticks. What’s your sequel? What dimension of your idea haven’t you addressed yet? And how often are you returning to old ideas in order to grow them? REMEMBER: The prerequisite for Thought Leadership is being a master of your subject. I challenge you to: (1) Write everything down, (2) Create a system for staying constantly relevant, (3) Read EVERYTHING and (4) Constantly add and explore new dimensions to your ideas. If you can do that, you’ll develop a knowledge base that is unquestionable. You’ll be able to talk forever. How are you adding value to your knowledge? For the list called, “17 Ways to become a Thought Leader,” send an email to me, and I’ll send you the list for free!